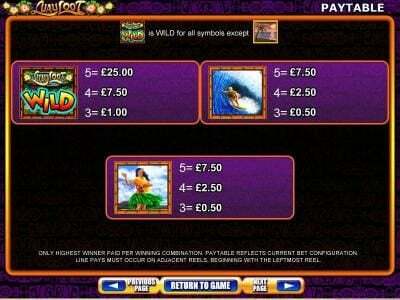 Luau Loot online slot machine pictures and slot feature list from WMS, play Luau Loot Slots for free. 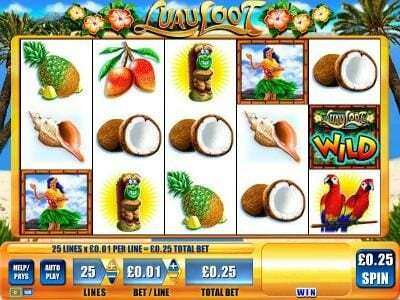 Luau Loot Slots has not been reviewed yet, be the first to rate this slot. 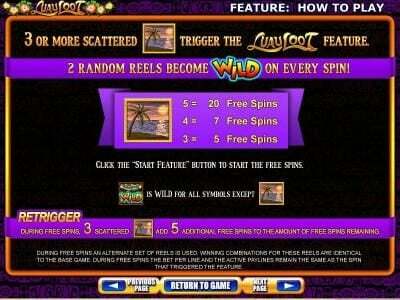 Luau Loot has a 5 reel layout with 25 paylines. 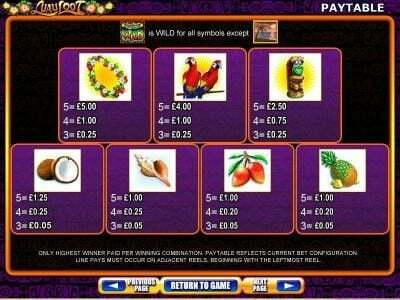 This wms design was created with features that include scatter symbols, Free Spins and wilds, while the top payout is worth $7,500. The game focuses on the Hawaii islands and the many things that tourists have learned to appreciate about them. The girl that dances is a part of the symbols which are used in this game and so are the various fruits, flowers and shells that you will find if you comb the islands and their beaches. The design is a beautiful one and the fact that it’s got flowers decorating the logo area does bring the game a little bit extra. The background image gives us a beach from the islands, with palm trees used on both sides of the reels. Among the symbols which the game has to offer you will find the logo of the game in the role of the wild, the surfer, the Hoola girl, the flower garland that’s placed around people’s necks, parrots, an idol, coconut, shells, pineapple and a beach view at sunset. The bets of the game use coins which have a value set by the player, in the $0.01 to $3 range. With 25 paylines in the game, and the requirement that all of them have to be selected while playing, the bets start at $0.25 and go up to $75. 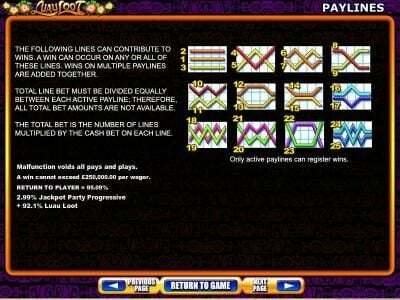 There is a 2500 coins jackpot on the line here, which will have a value of up to $7,500 if the maximum bet size was used. The wild symbol is easy to recognize in this case, since the Luau Loot logo has the word Wild written underneath it in this symbol. It will substitute for various other symbols in the game, with the exception being the scatter feature. It’s also the symbol that helps the player get the most out of this game, since a five symbol combination will award the top jackpot. The view of the beach, with the lone palm tree at sunset, serves as the scatter symbol in Luau Loot. The advantage of the scatter is its ability to form its combinations no matter where on the reels the symbols are. 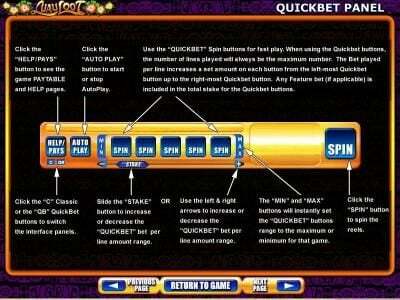 All you need is a minimum of three scatters and you will get the free spins offered in this game. 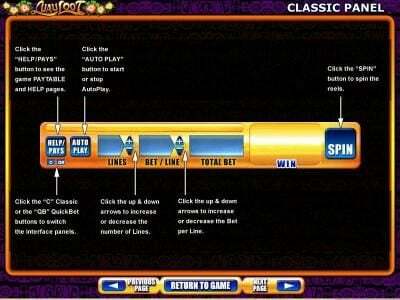 It starts with 5 spins offered for 3 scatters, continues with 7 spins for 4 scatters and with 20 spins for 5 scatters. Fans of Hawaii or any other kind of tropical holiday will get a kick out of this game. It also looks good, and that’s always a nice Bonus.